Who is a Salesforce Administrator? A Salesforce Administrator is a person who administers and manages an organization or any similar set-up. When a particular release has to be made for the production, lies within the responsibility of an Administrator. Why is he essential to hire in a business? Every business needs a manager at the very first instance to manage different aspects regarding how a sale has to be produced and organized fairly. Moreover, he is important because he plays a very major role in making CRM implementations easy and good going. Certification in any field is the perfect proof of knowledge one can provide to get promoted at higher ranks. A certified Salesforce Administrator is a must if you need him/her to carry the entire responsibility of their field for your business. Failing to this can leave you burdened with responsibilities which are almost impossible to carry along with the other responsibilities. Also, hiring amateurs for handling the same is also not at all beneficiary because of these lacks in both experiences as well as strategies to make things work. Expertise in a field comes with experience and this field is not an exception. Most certainly there arises confusion about “Is it necessary to look for certification even if the person has enough experience?” Yeah, if you are dealing with a small business then you may consider Experience as the sole thing to take care of but, if it’s a large business you own then you must look for certification also besides experience because certification is a sure-shot proof that this concerned person has done something in real. 3: Does he need to be a programmer? A salesforce administrator needs not to be a programmer specifically but the following things in him can make a difference:Understanding of the business processes. Understanding of the business processes. Great communication and motivational skills for encouraging and convincing the groups. An intention to be a non-biased communication media to carry user’s demand to the management authority. Management skills to implement even under conditions of immense pressure and workload. Skills to analyze imperfections and customizing them accordingly. 4: How many Salesforce Administrators are needed to handle users and management? The size of your business (large scale or small scale) plays a huge role in deciding the no. of administrators to hire. A small business with small user base can be taken through with 2 or 3, or even 1 administrator. But, if you have a large business setup and thus more responsibilities, you may need quite a good no. of administrators and business analysts. This ensures that no person is burdened with more responsibilities and work because of this way, the work is distributed equally among all. 5: How good is their relation with the organization they are working for? Carefully find out if the person you are trying to hire is directly involved in decision making and strategy designing with the company’s top authority or not. This reveals the reputation he/she is sharing with the organization. If he/she is just a doer whose work is to implement decisions made by top authority then there can be some flaws in his/her work( not to be sure about this). 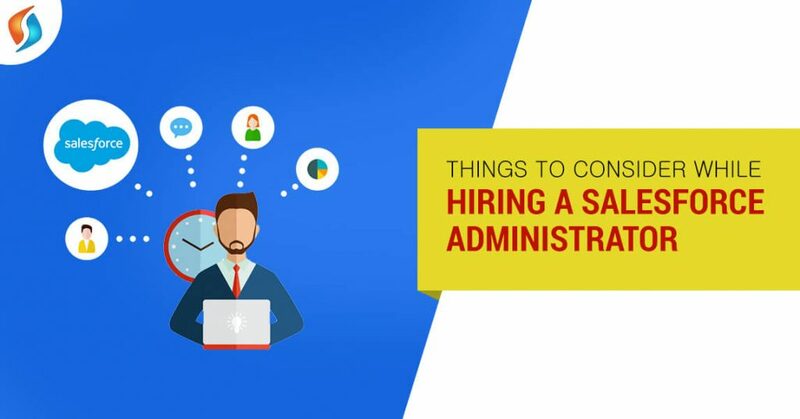 So, these were the key points you must think about before hiring a Salesforce Administrator for your work/ business. There are more points you should have clarity on but those are not as much critical as the above said one are. With decade of technical experience in CRM, specifically Salesforce. A highly energetic individual and an equally good team player, Abhishek has a deep knowledge of complex, challenging and custom CRM implementations as well as integrations. With strong analytical skills, he is known to manage and deliver crucial projects in time and per expectations.